A significant step in utilizing Chinese philosophy has been taken by the French luxury conglomerate, LVMH, and proposed and developed by Guerlain CEO Laurent Boillot. In a world of beauty, a new brand embracing Chinese wisdom was born, showing the growing worldwide interest in China’s rich culture and heritage. This significant step in utilizing Chinese ingredients and philosophy has been taken by the French luxury conglomerate, LVMH, and proposed and developed by Guerlain CEO Laurent Boillot. The idea to create Cha Ling came from Boillot’s discovery of the miracle ingredient, Pu’er tea, from the forests of Yunnan Province, through his encounter with late German biologist and conservationist Josef Margraf and his wife Minguo Li-Margraf. The beautiful story began a decade ago when Boillot visited Xishuangbanna to research orchid flowers for Guerlain with Josef’s help. “Our friendship started from there. It was a sort of engagement,” Minguo said. Boillot still remembered clearly the conversation he had with Minguo in December 2011, while overlooking the Mekong River. After Josef passed away in 2010, Minguo carried on the reforestation project and made every effort to protect the “kingdom of plants” from destruction. She wanted every species showing its value so the whole ecosystem could be protected. Boillot was impressed and touched by their strong belief that “biodiversity is the true gospel of the human race” and their goal to reverse the trends of destruction. He shared their desire to preserve the unparalleled landscape and wanted to offer help. To preserve the extraordinary ecosystem of the region, that produces Pu’er tea, Boillot imagined the creation of a brand providing “sustainable beauty in a sustainable world,” where ethics and aesthetics, luxury and sustainable development would become one. 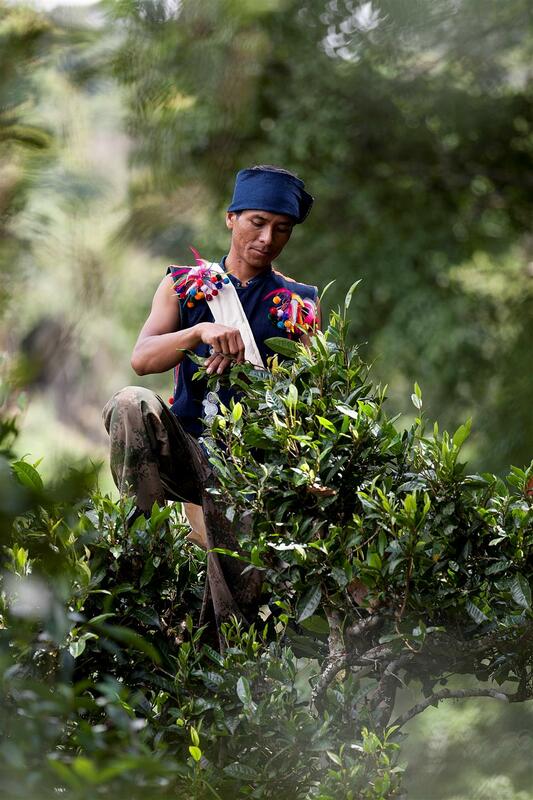 Yunnan Province is home to Bulang minority group harvesting the pu'er teas in the Bulang Mountain area. Pu’er tea had not been studied and used in cosmetics before Cha Ling, Boillot said. He worked with Minguo to search for the purest tea trees and gathered a team in LVMH Research & Development in Paris to study and analyze. LVMH laboratory in the French headquarters found out a wide range of active molecules against skin aging. Also, the Pu’er tea efficacy is deeply linked to the origin of production. 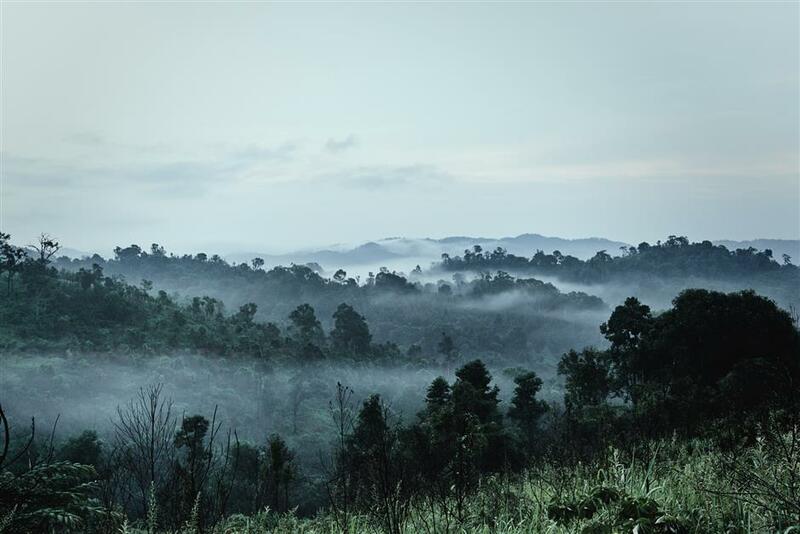 After evaluating several locations in the region, two forest tea leaf harvesting sites were selected to fulfill the strict specification criteria: Ganggang and Jingmai. The two areas were selected for their high altitude (more than 1,200 meters above sea level), low sun exposure, soil quality, richness of biodiversity and low density of plants which were to be spaced at least 3 or 4m apart. Within the terroir, a certain number of tea trees were marked for Cha Ling production according to very strict selection. Every tea tree, which has been certified by Ecocert, can be located by GPS to ensure the origins of the ingredients are traceable. Cha Ling signed a 10-year contract with two different Bulang farmers, harvesting old tea trees, who have developed an intricate system of growing and harvesting tea leaves with centuries-old wisdom. “We discovered the wisdom of the ecological system from the local Bulang minority people. They are the original minority group harvesting the Pu’er teas in the Bulang Mountain area. We were fascinated by their ecosystem: a very wise idea to grow tea trees inside the forest. By doing this, you don’t destroy the water system and surface of the mountain and everything is preserved within the whole system,” Minguo said. Cha Ling is willing to revive the ancient tea forest and preserve the true green spirit. Product profits will go back into the 20-hectare “tea garden project” based on Margraf’s reforestation plans. Young tea trees and other vegetal species have been planted in the terroir. “We can’t just inherit from our ancestors, we need to do something for our future generations. It’s a long-term project,” Minguo said. “Beyond the French know-how and all the philosophies we are engaged, we wanted to bring through the products to understanding customers, one day they will come back to the nature. Just by protecting the biodiversity, we guarantee the quality of our products.” In addition to harvesting the Pu’er tea leaves for the cosmetics line, Cha Ling also offers lifestyle products inspired by Chinese culture, including perfume, clay teapots, candles and ceramics. Sustainable development is at the heart of the brand. It combines a ritualized and holistic beauty approach based in TCM with French sensoriality to create a Sino-French new slow luxury beauty art of living. Bulang farmers have developed an intricate system of growing and harvesting tea leaves with centuries-old wisdom. The newly opened flagship store in Taikoo Hui is created by design guru Alan Chan. “The story has touched my heart. My work was to create a visual dialogue and philosophy turning into an identity and somewhat emotion because Cha Ling is going to be found globally in the future,” Chan said. With an “Oriental passion, Western harmony” design philosophy, the Chinese elements have been presented with modern twists. An elegant stage has been created that is modern yet classic to shed light on those meticulously created Cha Ling products on display, a tribute to an authentic Chinese art de vivre. Behind the retail section, there is even a spa room where Chinese massage methods and beauty philosophy are applied in the facial treatments. Cha Ling products are available in Paris, Hong Kong and Shanghai. It’s the first ancient Pu’er tea cosmetic luxury brand in the world developed by LVMH Research and made in France. 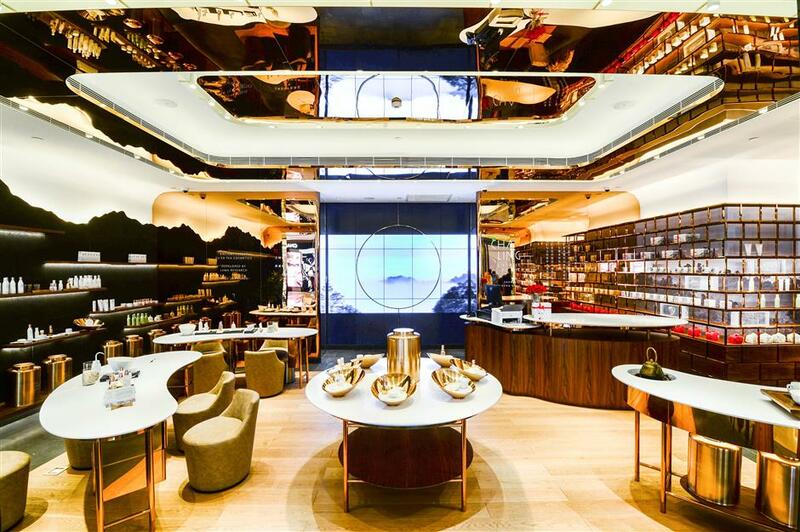 Cha Ling opened its first global flagship store in HKRI Taikoo Hui, Shanghai.